In my last post, Installing GoREST on Ubuntu Linux, I mentioned that I should really post a simple example of using GoREST. Here’s some example code for a Get and Post request using GoREST web services in golang. Also, this example isn’t actually using JSON. 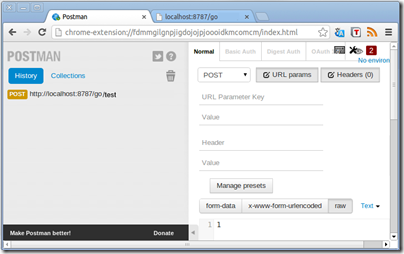 Check out the link at the end of this post for a JSON example. The GoREST install is silent, so you won’t see any feedback. My advice is to have a simple Hello World style example ready to go, so you can test your GoREST install. 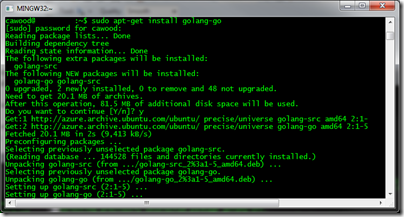 As part of my series on setting up a development environment on Ubuntu Linux running in Windows Azure, here are the steps to install and test the Go (golang) language. 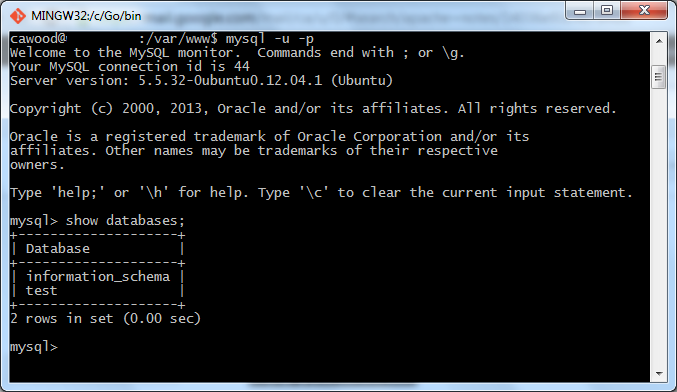 First you have to SSH to your VM and install Go, which is super easy. Note that apt-get might not install the latest version of Go, see thread on Stack Overflow about installing latest version of Go. You’ll be asking whether or not you’d like to participate in a program to track which packages are being installed. You may want to do some additional customization. 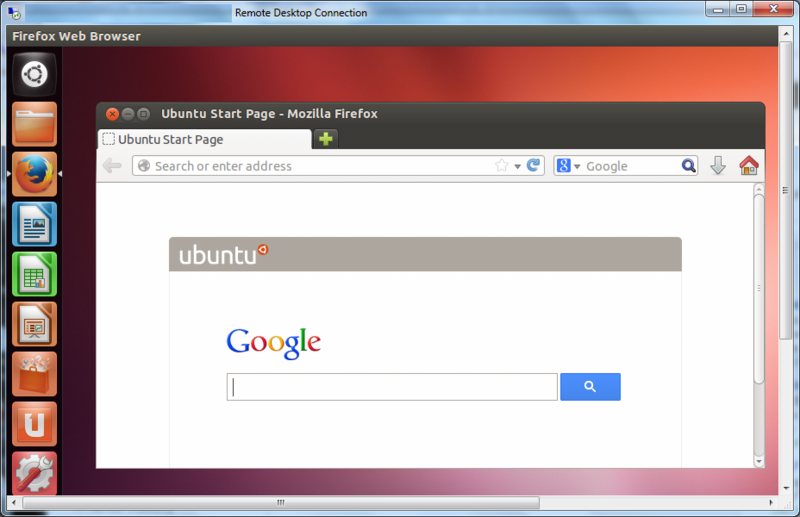 For more details, refer to this post: How to Install Google Go in Ubuntu by Joshua Price. 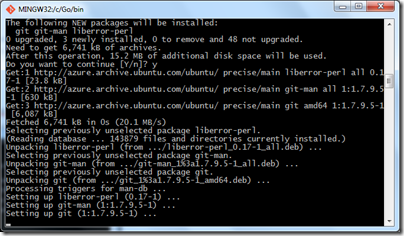 I’ve been writing some posts about setting up a development environment for Ubuntu running on Windows Azure. Here’s the short post on getting Git source control working. Installing LAMP is easy, there isn’t a word for how easy it is to install Git. It’s one command and you’re done. 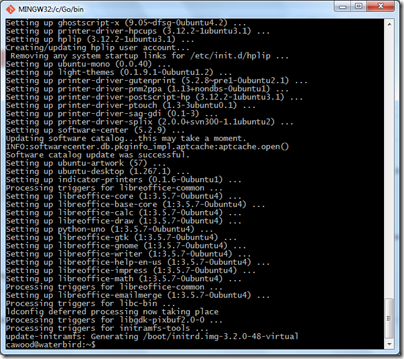 Done with the install that is… you’ll need to do a little config and then clone a repository or initialize one. Once you’ve got your install done, you can quickly configure your user settings with these commands. Also, if you’re new to Git, keep in mind that you can get the Pro Git book for free. Installing the rest of the L.A.M.P. 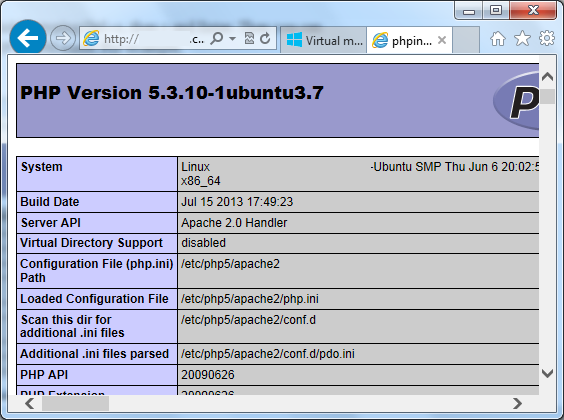 stack (Linux, Apache, MySQL, PHP) on a Windows Azure Ubuntu image is remarkably simple. You simply need to run two commands. 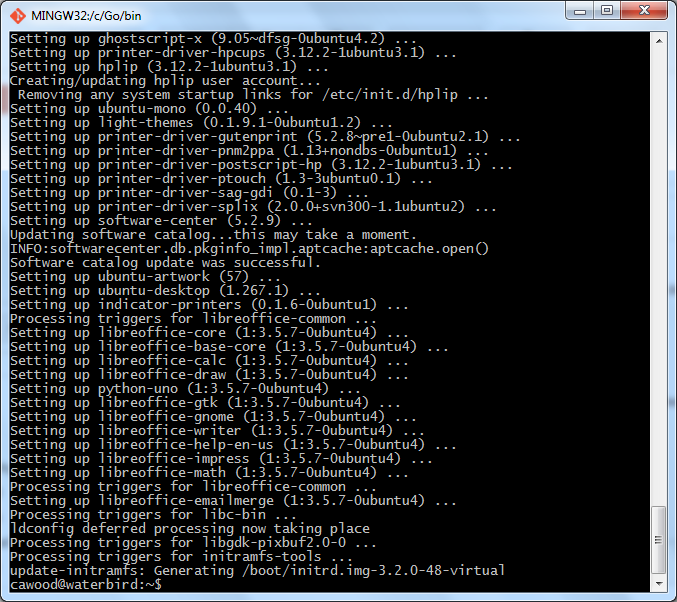 First install tasksel and then run tasksel to install the lamp-server package. It’s so easy that I’m also including instructions for testing that each component is installed and running correctly. After you’ve installed the LAMP stack, you can test that each component is working. On Azure, you must create an endpoint for the Apache port. 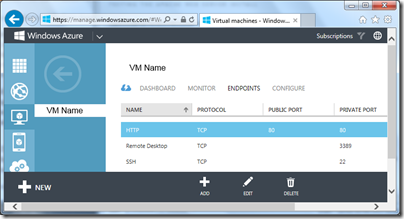 This opens the Azure firewall to allow communication across a port for Apache. 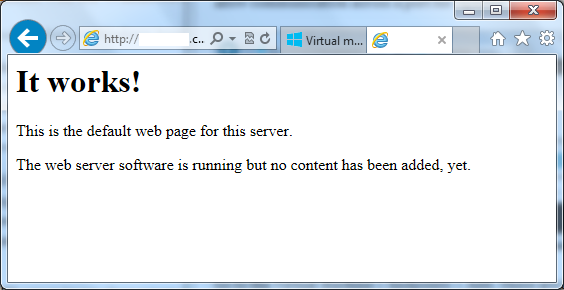 Go to the Virtual Machine > Endpoints > Add. These are the standard values: name: http, protocol: tcp, public port :80, private port: 80. Once you’ve created the endpoint, you can browse to your new Apache server. 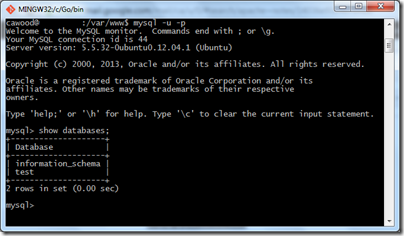 To make sure your MySQL install is working, simply run mysql and then type show databases; and press Enter. Couldn’t be easier. The result should look the window below. After you’ve made your changes, Save and Exit by typing Ctrl+x, then y and Enter. 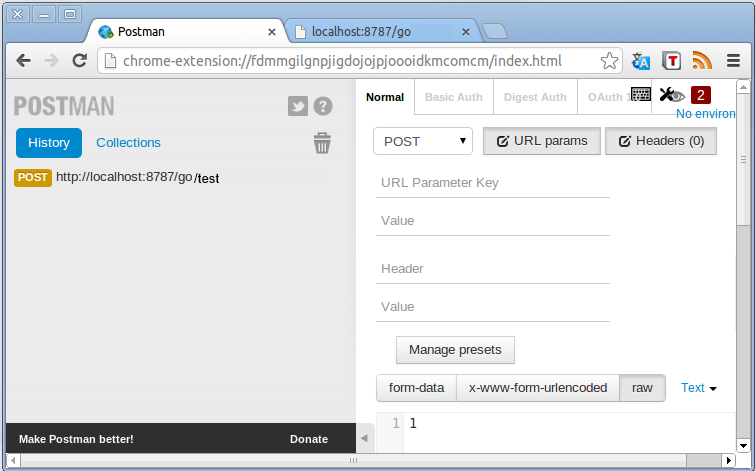 Then you can open the info.php page using your machine IP or DNS name. 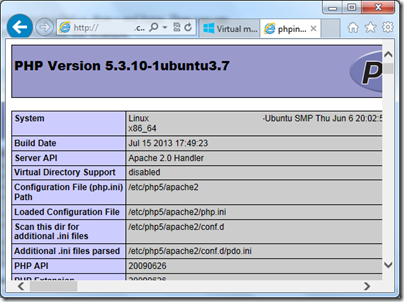 For example, http://myvm.cloudapp.net/info.php. There you go. The LAMP stack running on Windows Azure. 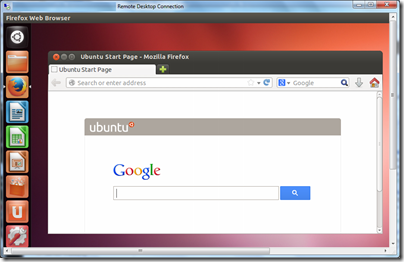 I was getting ready to write a post about connecting remotely to Ubuntu running on Windows Azure, when I found this post: Remote Desktop to Ubuntu in Windows Azure. Unfortunately, it doesn’t work with Ubuntu 13.4 (Raring Ringtail); which just happens to be the image I choose to install in my virtual machine. Rather than wrestle with it any longer, I’ve decided to create a new VM using the Ubuntu 12.04 LTS Server (Precise Pangolin) image. You may wonder why anyone would bother setting up remote access since you can SSH into the machine remotely and do everything through the command line. For me, the answer is quite simple, I want another way to connect in case something goes wrong. I’ve had VMs get into bad states (both one Amazon AWS EC2 and Windows Azure), so I’d like the option to connect as many ways as possible. Note: I've used the Ubuntu 12.04 LTS server image since newer versions of the Ubuntu Unity desktop don't have a 2D mode and therefore are difficult to use with remote client software. If someone has the solution to this issue, please leave a comment. 1. Connect using SSH. I like the Git Bash terminal that comes with the Git install. PuTTY is also a good SSH client. 2. Install a desktop. This command will take a while, so get yourself a cup of joe... and feel free to make it a grande. 3. 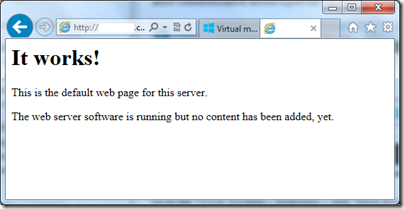 Install XRDP/ VNC Server. 4. 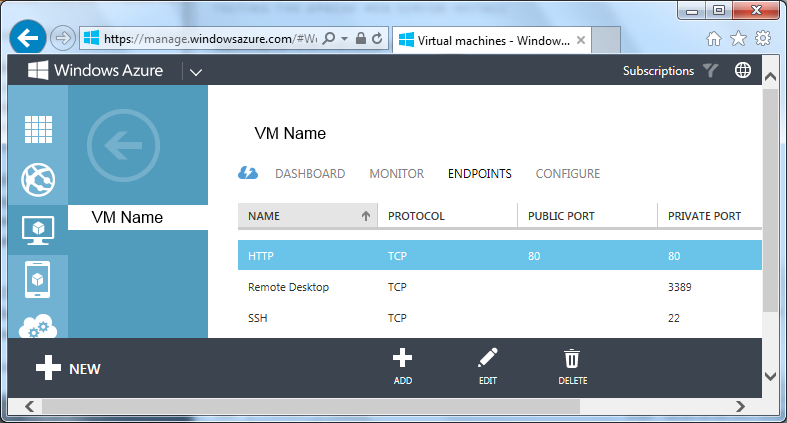 In the Azure Management Portal, create a VM endpoint for XRDP. 3389 is the default port. 5. Use the "Connect" button from the Azure portal to download an RDP shortcut for your VM. 6. Open the shortcut and login. 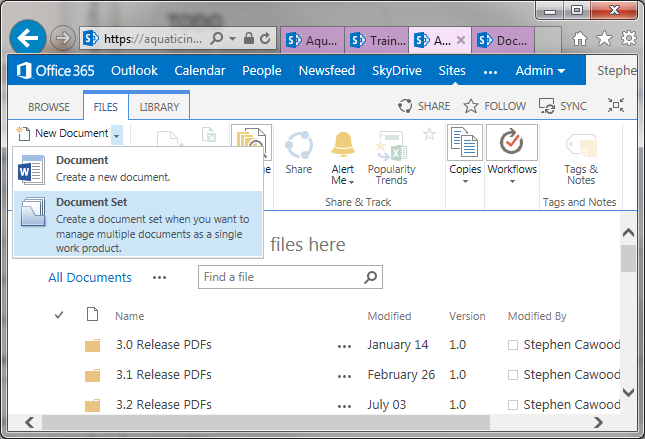 This first key point is that this feature is only available to Office 365 Enterprise plans. If you’re not sure which plan you’re on, check with an admin. 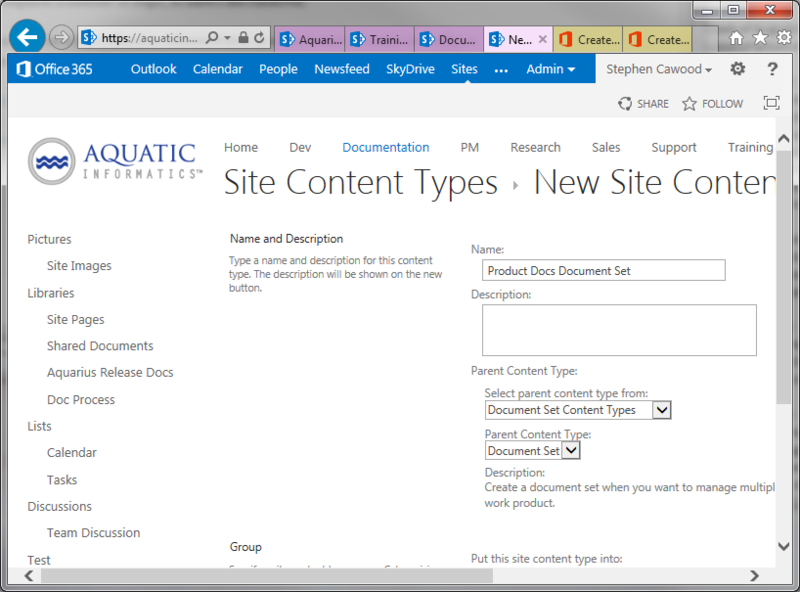 Note: You must be a Site Collection Administrator or a Site Owner to create or configure Document Set content types. 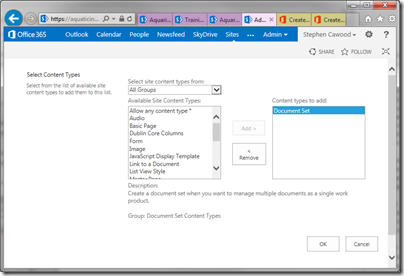 Note: you don’t need to worry about the “Configure or customize a Document Set content type” unless you actually want to customize something. 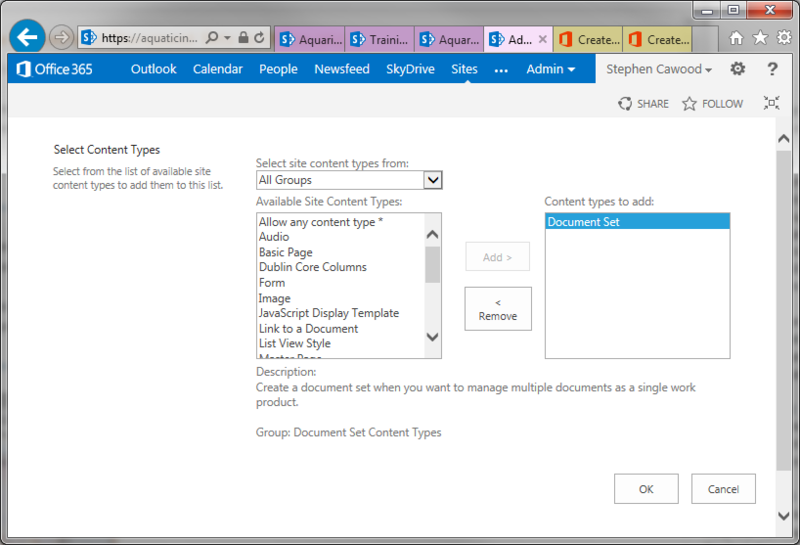 After you create and configure a Document Set content type, you must add it to the library where you want users to create their Document Sets.